The new Black Dog Cycle Works TRACTION Footpegs are designed to answer the call for riders who prefer to tackle difficult terrain in all conditions. Sharp teeth greatly enhance traction in wet and muddy conditions while minimizing wear and tear on riding boots while standing. For enhanced traction, threaded spikes are supplied to provide the ULTIMATE in wet weather traction. We've taken our Platform Footpegs another step forward in our exclusive footpeg line-up. 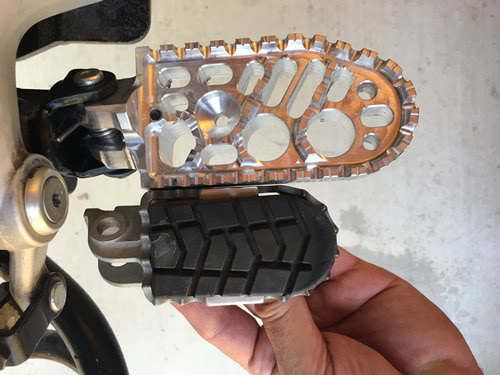 By utilizing the same size and shape as our popular Platform Footpegs and adding enhancements for better wet weather traction, these peg designs "knock it out of the park" according to one of our trusted testers, Jason Houle. Our new TRACTION Footpegs are sure to please. We've opened up the void areas to allow mud, snow and debris to flow through; changed the teeth from flat to a pointed style; and most importantly, used a thread in "traction spike" to ensure maximum grip on the pegs in wet conditions. Another innovative feature is that the threaded spikes are removable to reduce wear on the soles of your boot when not in wet conditions and be replaceable! Our pegs are 2.5-inch wide x 4.5-inch long and weight only 6 oz. each. This creates a LARGE, STABLE platform from which to control the bike. 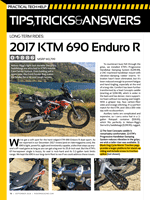 They greatly improves control of bike—it’s like adding power steering! As with our Platform footpegs, these pegs are 1/2 " lower than stock. It may not sound like much but feedback confirms it is noticeable. Standing up is so much less fatiguing with the large platform distributing your weight. Enjoy the rider longer! By creating larger voids in the peg platform, this new design allows mud, snow and debris to flow through the pegs to keep the treads cleaner. We've also enlarged the bottom of the openings to aid in clearing the pegs. These pegs are milled out of tough aircraft-grade aluminum alloy. We've added TRACTION cleats around perimeter of the peg and removable threaded spikes for the ULTIMATE in traction and control. The threaded spikes are removable (and replaceable) to reduce boot wear for riding in less demanding conditions. We are the only company we're aware of who provide an special “installation pin” which greatly simplifies installation. We also provide replacement cotter pins—no trips to the hardware store required. 5 minute install time. No bones about it, we manufacture all of our Black Dog products right here in the U.S.—supporting the local craftsmen, materials and machinery. We have world-class manufacturers in our own backyard and are committed to supporting our local economy, something that's extremely important to us. We feel supporting the U.S. manufacturing base has never been more important. All of our own products are rigorously tested on our personal bikes BEFORE they’re released. Our innovative and rugged designs are used throughout the world—a fact that we’re very proud of. We make no pretense that we’re the cheapest, but, you can be sure that BDCW products are the best made and that we stand behind them. "I've been riding adventure bikes since about 2008 been doing a lot of prototyping for many of the adventure market people that are out there, and the latest one that I've been trying is the traction pegs from Black Dog Cycles Works. "I've been running BDCW pegs for over many years—several different styles that have been tested. I can attest that the new TRACTION Footpegs do not slip when you get them wet. They have been great traction, and not as many studs as another popular brand, which tends to tear up the bottom of your boots quickly, yet the BDCW pegs still give you plenty of traction. "I just have put a little over 4,500 miles on these and in part of my last adventure down in South America and I'm telling you they have held up great and I am very, very pleased with the new traction pegs, so if you're looking for the same great quality that Black Dog Cycles Works puts out you love the platform to give you comfort on those long days. Take my word for it you will love these new TRACTION Footpegs. They are a must especially if you live in wet country or mud. Oh yeah, and of course they still have the bottle opener for the end of the day to crack open your first beer!!!! Thanks for listening to your customers Kurt. Another fine product and a great job. "—Jason Houle, Rawhyde Adventures Coach, Trainer, Tour Guide.